Water Street Home Would You Like to Buy Some Bottled Sunshine? Would You Like to Buy Some Bottled Sunshine? Confused as to why someone would purchase a bottle of sunshine or fresh air? If you accepted my challenge above and attempted to add a product to your cart, you probably noticed the message which states, “Buying this product doesn’t make sense. It’s just like buying bottled water.” Many customers who came into the Dupé store had a reaction similar to this message, saying they can get these resources outside and finding it senseless to spend exorbitant amounts of money on them. Well, that’s the point! 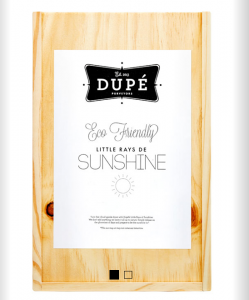 These Dupé stores are actually fake pop-up shops meant to show people how absurd it seems to buy bottled versions of resources we otherwise take for granted. Take a look at the video of some customers’ reactions here: http://ecowatch.com/2014/03/20/viral-video-insanity-of-bottled-water/. Although this campaign takes place in Australia, the concept applies to countries worldwide. We often take our quality tap water for granted, forgetting that there are countries out there that have no access to safe drinking water. Referencing back to one of my previous blog posts from 2012, “Tap vs. Bottle,” tap water is often about a penny per gallon while bottled water is an average of $4 per gallon. Aside from cost, bottled water also creates tons of waste. About 85 percent of all plastic water bottles consumed in the U.S. end up in the trash each year instead of the recycle bin, and those bottles require a great consumption of energy and petroleum to produce as well. I can understand the desire for luxury goods, but as the “Be Smart. Choose Tap.” campaign shows us, it’s good to use common sense as well. I think it’s safe to say that choosing tap water over bottled water benefits our health, our environment and our wallets.